One of my least favorite parts of gardening is battling the deer. It seems that every year just when I think everything is growing great, I find evidence of deer in my garden. This time it was my bulbs that had just sprouted. The deer had eaten my lily's down to just stubs. While this is heartbreaking, unfortunately it's nothing new for me. I live in an area with a lot of wildlife so it just makes sense that the deer will get in my garden and treat it like an all you can eat buffet. 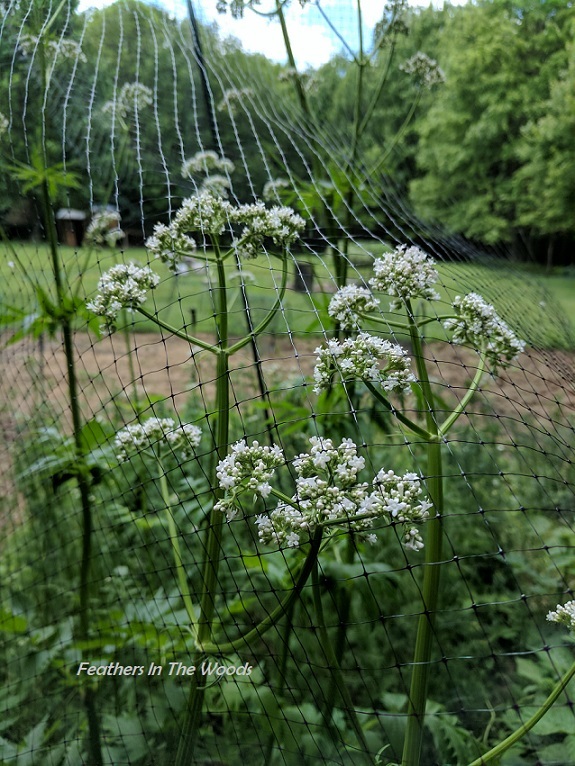 I have tried just about everything to keep deer out of my garden. From fences to scare tactics, I've done it all and it sort of works. The biggest problem with keeping deer out of your garden is that they will adapt rapidly to anything you may try. Yes, many different tactics may work, but nothing that works well works forever. The most effective deterrents for 4 footed garden pests are physical barriers like fences or netting's. 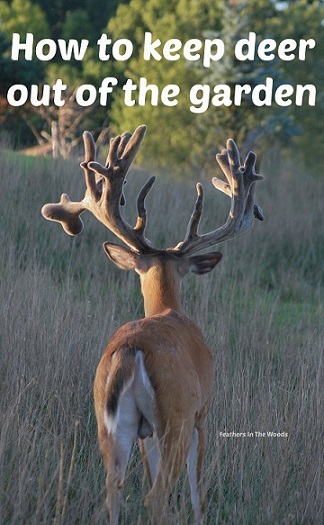 Garden fences should be 8 feet tall to be most effective against deer. Some people have luck with shrub walls if they're very thick and dense. Floating row covers: these can be placed over low plants to protect them from the deer. This works well to keep plants safe in spring though you may have to remove them as the heat of summer sets in. Plants with textures deer don't like: woody ornamental grasses and fuzzy lambs ear are some plants deer don't seem to favor. Here is a complete list of Plants Rated By Deer Resistance by Rutgers University. Plant strong smelling herbs: lavender, patchouli, lemongrass, yarrow, onions, garlic, rosemary, oregano & catmint. The strong scent of these herbs helps block out the yummy scents of the rest of the garden keeping deer away from the garden. Egg spray: 1 raw egg per 1 quart of water. Blend well then strain out the thick parts before pouring into a spray bottle. The sulfur smell is what repels the deer. The scent is supposedly worse for deer then it is for people, I just wouldn't spray it the day before you're giving a garden tour! Hot pepper spray: Soak hot pepper flakes in water overnight. Strain and pour into a spray bottle. Spray on foliage. Reapply after it rains. For an even stronger concoction, add a few crushed cloves of garlic to the mixture. I show how I make it here: 8 Tips to keep rabbits out of your garden. Close to harvest time when you don't want to spray anything on the plants, you could soak a rag in any of these deterrents and hang it in your garden on a short garden flag pole. Mark the garden with urine. When walking your dog make sure you walk around the garden so he can mark the area. The deer will smell him, think there's a predator nearby and stay away. This works no matter how small your dog is. You could also use human urine so if you have some young boys tell them it's ok to "water" the gardens edge! You can also purchase coyote or fox urine to apply. I don't recommend this if you have chickens or other livestock since it can also attract coyotes or foxes. If you don't have small animals to worry about though, this is a very popular deer repellent. Soap: this seems to be a popular method. Some say Irish Spring and others swear by Ivory soap. Whichever one you choose, the important part is to grate the soap and hang it in mesh bags around your garden. I use the small lemon bags from the store, but old pantyhose work well too. Human hair: hung in mesh bags about 3 feet high, the scent of human hair may deter deer. Ask your hairdresser to save some hair for you on your next visit. Blood meal powder can be sprinkled around the edges of the garden also to deter deer. Let the dog out. Between marking his territory and barking at deer, having a dog can help keep deer away. Deer are smart enough to catch on though if you keep your dog in a kennel or on a lead, and they'll just stay away from the dog but not the garden. Anything with a sensor: sprinklers that are motion activated or lights that suddenly turn on in their faces. Anything that will pop on the second deer walk by can startle the deer and send them scurrying from the garden. Scare tactics: lights, cd's hanging from fishing line, wind chimes, scarecrows, chimes, radios, hanging scare balls. These all seemed to work for me for awhile, but ended up losing their effectiveness over time. It can also help to just throw deer netting over plants when they are small. This works especially well in the early spring when there isn't much else for the deer to eat. Leave the netting on as the plant grows a bit to give it a fighting chance. Keeping deer favorite plants close to the house. I forget where I read this one, but the lily's under one of the bedroom windows gets nibbled almost every year...so it's definitely not true. Motion lights on your house: Unless the garden is right next to the house, then it might help while people are home and awake. The deer will quickly get used to these. To be effective a motion light should be in the garden and moved often. You'll rarely find one tactic that will work to keep all the deer out of your garden all the time. To increase your chance of protecting your plants, try doubling or even tripling up on your deer deterrent techniques. You might even want to use different methods on a rotation and change it up every few weeks. Keep in mind that if deer get hungry enough, nothing but a tall fence is going to keep them from eating from your garden. However in normal conditions and with a bit of vigilance you should be able to keep the deer from doing too much damage to your garden. Having problems with different types of critters snacking on your garden too? Click here for my other posts on deterring garden pests! We have a terrible problem with deer eating our vegetables and plants, too. I'm pinning this article for future reference. Thanks! It's so frustrating, isn't it? Hope this post helps! Great tips. Thanks for sharing at To Grandmas House We Go. Scheduled to Pinterest too. Awesome tips! You'll be featured at the To Grandma's House We go link party that opens tomorrow morning, thanks for sharing with us! You have some great ideas on deer deterrents. Where we live we don't have problems with deer but ground hogs, but my where my sister lives nearby she is constantly evaded by deer. Congratulations on being featured on Homestead blog hop.Pinned & tweeted!